When evaluating the current coalition government's first year, President Dalia Grybauskaitė stressed that there should better be no changes than ones that are poorly prepared and antagonising for the public. In her opinion a number of areas look like construction sites where it is unclear as to what, why and how will be built. "Ideas do not turn into results on their own. You must know how to implement them. It is a long and difficult path in politics, the whole process is negotiation, convincing, listening, compromise. Lacking all this even the best ideas are doomed," President Dalia Grybauskaitė emphasised in her interview with Lietuvos Žinios. The president states that voters associated hopes for sweeping changes and a better life with the current majority, which granted it a great credit of confidence. Unfortunately she observes that the first year of LVŽS leadership was marked by uncertainty, fading hopes and loss of confidence. The time to fulfil promises has come, but President Grybauskaitė notes that reforms have been replaced by a number of issues, ranging from shifting to discussions on low significance issues, to managerial failures where institutional memory is demolished, without creating anything new and operating with interim leaders, to inconsistency with values, declaring intent to combat corruption, but lacking the will to clamp down on corruption in municipal procurements or viewing MP Artūras Skardžius' actions with a principled view, or needing to be reminded of the ideas of social sensitivity. Nevertheless she concedes that the budget project for next year does reflect the country's main priorities, with the government adhering to strategic and long term commitments in defence and sustainable finance. "Vitally important structural reforms must be performed, but the questions needed for them are pushed out of the agenda by various politicised investigations, commissions or pseudoprojects which antagonise the public. In some questions of import to the state and the people I have found common ground with the current Seimas. I proposed 33 legislative projects this year and almost all of them passed. Important decisions have been made in orphanage reform, state and municipal company and institution leader terms have been limited, reforms have been initiated in the Centre of Registers, tariff accountability has been made more strict, as well as for other major, particularly corruption crimes, the possibility of trying major fraudsters has been improved, my proposed amendments to the Labour Code passed, having been untenable for the previous Seimas majority," Dalia Grybauskaitė reviewed the year. The government promised and attempted a number of reforms – higher education, state service, forestry and taxation. Regarding this, the president emphasises that, "Ideas do not turn into results on their own. You must know how to implement them. It is a long and difficult path in politics, the whole process is negotiation, convincing, listening, compromise. Lacking all this even the best ideas are doomed. And changes for the sake of changes or those with only doubtful benefits are only the imitation of reform. Better there be no changes than ones that are poorly prepared and antagonising for the public. We must know clearly what is going to be done and equally clear – how. So far we can see neither." She points out that while an extra 600 thousand euro has been earmarked in the budget for social problems, monetary injections are insufficient to combat the phenomena, particularly in light of how fast income inequality is rising. The scale of the problems is so large, D. Grybauskaitė says, that the public also needs to become involved in solving them. "No statistics can measure what happens when in a child's life family replaces the orphanage and a day centre replaces the streets. When a woman who experienced violence begins a new life after being encouraged by mentors. All of this is reflected in our reality, it gains ever more positive hues. We must make use of economic growth to reduce social segregation as effectively as possible. It is not enough to boast of economic metrics – GDP, pension and wage growth, decline in unemployment because at the same time our people's wages are still far lower than the EU average and inflation simply "eats" the minor income growth. Far too many citizens have been gripped by poverty and are unable to free themselves," the head of state emphasised. She finds that there certainly have been efforts to remedy the situation, ranging from more generous monetary support and compensations, to public sector wage raises, to children's rights legislative reform, as well as increased attention to aiding families. This is expanding into the municipal sector, where funding is being used increasingly more effectively. Unfortunately, D. Grybauskaitė notes, these laudable advances are still not enough. Structural reform is needed, particularly in education and healthcare, but so far political will for this has been lacking. She points out that while wages and grants have their importance, it is also important to emphasise human dignity, "Expats have not forgotten the disrespect and corruption they experienced. As such when we seek solutions, we must consider the whole picture. Lithuania will only change when we all change it together, when we all feel responsible for our country." Having touched upon expats, D. Grybauskaitė expresses support for establishing dual citizenship and the referendum needed to amend the Constitution to allow this. As far as the odds of success are concerned, the president believes it is a matter of preparations, being certain about formulation which matches both expectations and national security interests, as well as politicians and parties being able to mobilise and unite the public, involve the global Lithuanian communities. President D. Grybauskaitė observes that the current lack of a formal majority in Seimas may lead to a lack of resolve to perform planned reforms and the tasks the public have been waiting for, if matters devolve into routine, only making minor changes and amendments, but leaving aside fundamental changes which demand both will and resolve. Regarding the Social Democrat Party's fracturing, she points out that the conflicts and bickering undercut confidence in the entire political system. Nevertheless the party's fragmentation is certainly no new phenomenon and D. Grybauskaitė believes that it will either return to form and gain strength or else the situation will remain difficult, if the changes are not based in ideology, shared ideas and views, but instead a desire for power. Despite how difficult the situation may appear, she believes that in any difficult situation we must also see the possibility of renewal. In terms of the scandal struck Liberal Movement, the president only emphasises that there is no better teacher than one's own mistakes, if one failed to learn from others and it is up to parties' accountability, whether they will raise or waste the vote of confidence they received during the elections. With surveys showing that half of citizens say they are unsure who to vote for and at the same time certain parties and politicians known for populist ideas being on the rise, D. Grybauskaitė observes that the party system in Lithuania is undergoing crisis, however after reaching the bottom the only way is up. She points out that last year an important signal was sent to the established parties in the left and right when the majority was formed by a new player. "And this isn't bad. Some received the chance to try their abilities, others – to compare what advantages the new option has. The possibilities for the party system to grow stronger are in the hands of the parties themselves. Their ideas, decisions, actions and behaviour shift people's opinions, which react sensitively when the government is used only to seek personal goals and fails to earnestly work for the common good," the head of state said. Having been a proponent of direct mayoral elections, the president believes this has brought more stability to municipal governance, where before due to fragile coalitions and political migration, mayors and municipal leadership would change several times per term. Instead now there is less struggling for power and more opportunities to perform assigned duties. "Direct mayoral accountability to voters also contributes to establishing real municipal governance, where rather than deals, it is the voters' will that decides who will lead the municipalities," D. Grybauskaitė said. "I will pass the regalia to whoever is elected by the Lithuanian people. I trust in our citizens' awareness, ability to choose, evaluate the whole responsibility. I will uphold the principle of neutrality and won't support any candidate," President D. Grybauskaitė said, stating that in a democratic state it is the voters who should choose. She emphasises that the environment for this has improved in Lithuania, with bans on legal entities supporting candidates, limiting election expenses, as well as varied news media and electoral system and procedures which have been evaluated positively by international experts. D. Grybauskaitė does not reveal what her plans are following the end of her second term and only stresses that she is dedicating all her time and energy to her current duties. She only notes that she intends to continue to participate in state life even after her term ends. As a supporter of the initiative Idea for Lithuania, D. Grybauskaitė states that the initiative was born with the goal of involving the public and encouraging it to consider and create ideas of what we all want to see Lithuania as, with the country about to celebrate its centenary. Something rising up from the bottom, rather than being ordered by authorities from above. Her own idea which she worked with from the start of her first term is that of a safer and more just Lithuania. The president points to results in the sphere of national security, including further commitments by security partners and improved national defence measures. As the same time she observes that in the energy sector, the country has also become less dependent on the politicised Russian energy sector. "During my second term I concentrated on social security questions. There were great changes in the court system, however in the area of justice we should seek great intolerance toward corruption, to be rid of double standards and those feeling untouchable, to cleanse the poor reputation of meting out justice. 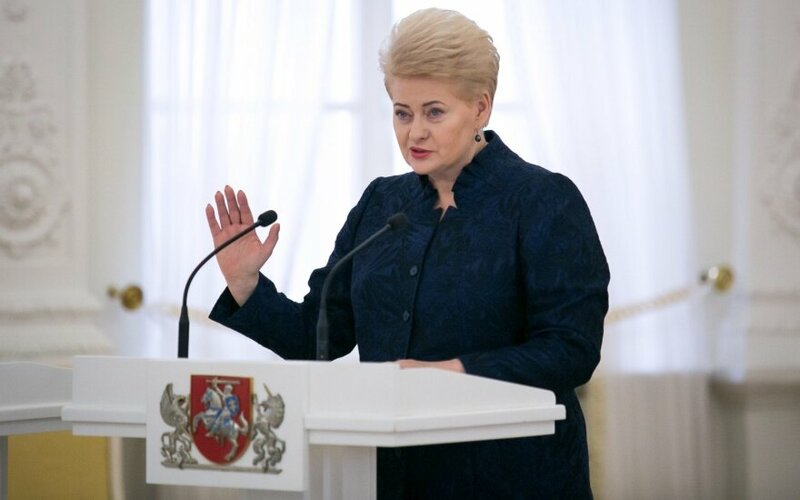 I wold greatly want for all Lithuanian people to participate in this process," President Dalia Grybauskaitė concluded. V. Uspaskich is returning. Will his plans come to fruition?